Last Saturday, February 28th, was a very eventful day. I started my day off waking up at the prime time of 4 am. The low temperatures were at our disadvantage, none the less we over came this feat with the glorious picture of going to the state competition. The commute to the school was pretty hectic. The teams reside in different parts of the city, making it difficult for us to get to school together and at the same time. As 5:30 am was arriving soon, and the bus was still not in sight. At one point, I ended up running down the street in front of the school with Sabrina. I was scolded by multiple people about it being to cold outside. Shortly after, the bus arrives and we load up. The ride there was relatively relaxing and pleasant. Some were still half asleep, others making conversation with one another, and those, like me, who looked at the scenery the majority of the ride. We arrive at the venue of the competition sooner than I would have expected. We exit the bus and were immediately hit with a blast of the crisp and cold air. After unloading our things, we enter the building. I took in the amazing and exhilarating view of what States really was. So many teams had already arrived along with their robots; Their robots were jaw dropping. Some might think that the sight of impressive robots at a competition that you are apart of may not be the most pleasant things to see. However, the sight rather intrigued me and gave me a sense of competitiveness, motivation you could say. Once we spotted our tables, Gold immediately got to work. Inspections had to be done by 10:15 am and our presentation time was 8:40. Thankfully, we were rather prepared and were able to successfully compete in a majority of our matches. Though some parts of the robot were not necessarily finished in the beginning, we eventually did. Vincent and Jiong Heng were even able to score 8 points into the rolling goals. One problem over another, I would say we did a rather good job at solving them. As 10:15 rolled around and the opening ceremony took place, the real hype had just begun. Teams running back and forth to fix parts on the robot, drivers going about getting to their matches, Saturday was fueled by nothing but energy. 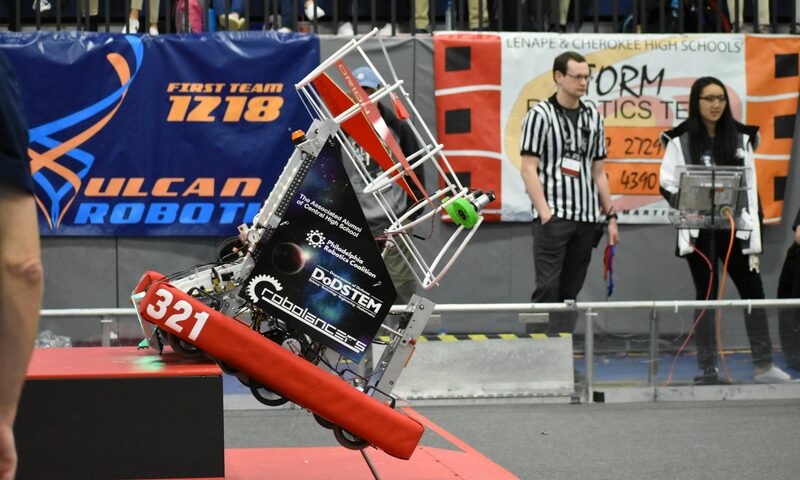 As a result of the many teams, 36 teams from around the tri-state area, matches had to be run a lot quicker, meaning there was less time for mistakes to be fixed. In between the matches, I had time to explore and mingle with potential alliance partners. Creating strong relations are important and the people there were very pleasant to be around. Not to mention running around in Rock’em Sock’em costumes was also fun to do. 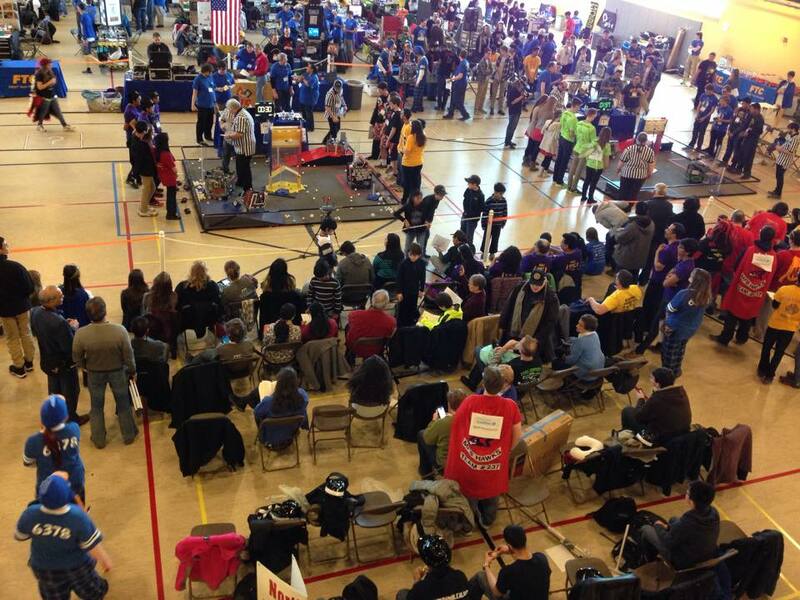 Once the preliminary matches finished, the top 4 teams picked their alliance partners. At one point, Gold’s hopes sky rocketed when the digits “53” were spoken out from the mouth of Tom, of course the ending digits were not in our favor. The team “5319” was chosen instead, which was a bit upsetting to us. However, we won’t continue to be upset about it for what we did accomplish that day was very impressive to me. Overall, States was a great experience. This was my first year on the team and also my first big robotics competition I went to. From being nervous around the judges, to running around finding individuals, to group dances, it really was amazing. Despite not qualifying for the Super Regionals, I think we have overcome a large hurdle throughout the year. Keep up the good work Gold!